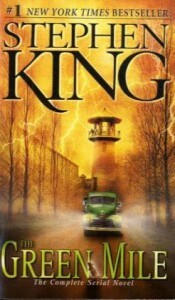 The Green Mile is the first book I've read by Stephen King, and I finished the book disappointed. King appeals to the basest of emotions in his readers and often utilizes cheap literary techniques in his storytelling. These include a first-person narrative; a casual, conversational tone of writing; and the inclusion of slang and misspelling to indicate Southern accents. While these techniques can be used at times for a justifiable reason, King uses them just for style, and it comes off annoying and pop fiction-ish. The book includes--even centers around--supernatural elements. These elements were the most captivating parts of the story, and revealed a creativity of King's that isn't readily apparent from his writing style. Overall, I was unimpressed and would not recommend this book.